Workplace accidents are no laughing matter. Countless occur every year, resulting in injury to workers and damage to client and company property. However, many of these accidents are ultimately preventable when employees take the necessary precautions and plan ahead for potential problems. Keep some of these common construction site accidents in mind and remember that prevention is as simple as checking the area. According to the Occupational Safety and Health Administration, one of the biggest sources of accidents on construction sites is materials and substances left on the floor to slip over. Construction sites are often busy places and it can get easy to leave behind small trails from carrying materials. However, preventing such problems can be as easy as making sure that the walkways and work areas around the site are kept clear. Make sure that employees walk along the designated areas when they carry materials and always be ready to clear up an obstruction or spill if you notice that it is in the way. Being hit by a falling object is always a risk on a construction site, no matter how careful every party is being. Under OSHA, falling objects can include falling materials, tools or waste debris, and the threat is particularly pronounced for those who are not wearing proper safety equipment. In order to combat this problem, it is critical for all employees to make sure that they use and wear the appropriate safety gear. When setting aside tools or materials, make sure that they are on a level surface, as this prevents them from falling if they are accidentally jostled during work procedures. Electrocutions are some of the most common causes of death in the workplace. Electrical safety should never be taken lightly, and experts who work in the field should always take the necessary precautions in order to avoid serious injury or death. If there are any exposed wires on the construction site, it is critical to isolate them and keep them in place as soon as possible to avoid potential injury. Additionally, OSHA recommends wearing the proper gear when working with electricity can be an excellent way to avoid accidents, even when all other precautions have been taken. 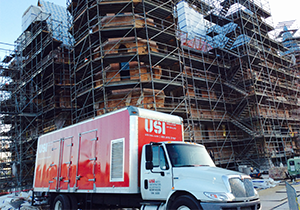 For more information about common workplace accident prevention or to learn about insulation, contact USI online to find a branch near you and get a free quote. USI believes in excellence in every step of the process and ensures timely completion and quality of service, time after time.